Kaynan Duarte and Tex Johnson stand out in New York City. 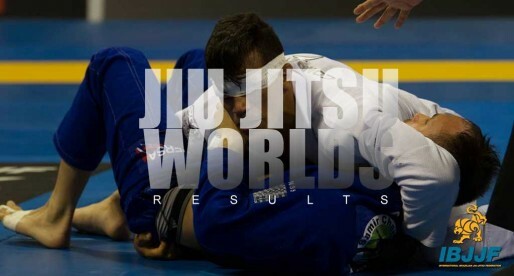 Home BJJ News Kasai 5 Results: Kaynan Wins, Tex Submits Pena! APRIL 07, 2019, MANHATTAN CENTER, New York, United States of America was the perfect scenery for the 5th edition of Kasai Pro, one of the biggest professional promotions in no-gi grappling today. 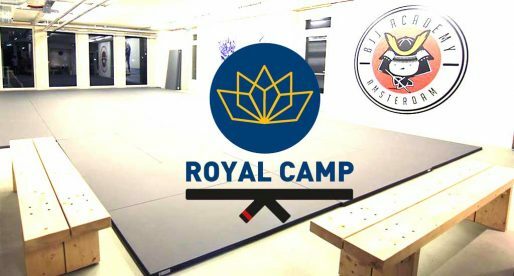 With another solid card, the Kasai Pro 5 filled out the venue to completion and had the fans at the edge of their seats while watching high-level jiu-jitsu on display at the event’s heavyweight Grand Prix. The tournament had in Felipe Pena and Craig Jones, the favorites to succeed, followed by Kaynan Duarte as the Dark Horse and in the end, the horse ran faster than all the others, winning the tournament with only 1 point scored against him. Below are the full results for the Kasai Pro 5. Good matches throughout the prelim, though most of the attention was focussed on the Sergio Vilas (Renzo Gracie) versus Vinicius Ferreira (Alliance), a very controversial match. The bout between these two super-heavyweight athletes saw Ferreira controling much of the action from a positional stand-point, sweeping early on and controlling from the top until the final seconds of the match. This is when the first controversy occurred: As they both stood up, Sergio went for a takedown, ending near the boundary and with no time left to stabelize the position. Even though the double leg was not stabelized (Vinicius appeared to be on his way up when time ran out), the referees awarded the 2 points to Vilas, making the scoreboard even and taking it to overtime. On the “golden score” round (first to score wins), Vinicius pulled guard and went for a “kiss of the dragon” type sweep, as he inverted, Sergio attempted a kneebar, an attempted never defended by the Alliance athlete, who took the spinning momentum to take Vilas’ back. The referees saw the 1st point to be scored the submission attempt, giving the win to the hometown favorite, Vilas. Outstanding and forward moving performances by Leon and Mayssa who submitted their opponnents. Bastos steamrolling through her adversary, and Dante having a serious scrap with Najmi, with plenty of scrambles and point exhanches before the Canadian sinked in his choke. Another picture perfect performance was that of Marcos Tinoco, who defeated a living legend of the sport tonight in Barral. It wasn’t the cleanest performance in the world, but when you fight an ADCC and World champion, you do what you have to win. Marcos dominated the stand-up grips and got a couple of kouchi gari to conquer his 4 points, playing rather conservatively from then on. Nevertheless, huge day for one of the nicest athletes in our sport. A great overall tournament, the man of the hour was, without a doubt Aaron Johnson. Wow, what a performance by “Tex” the Unity JJ heavyweight. 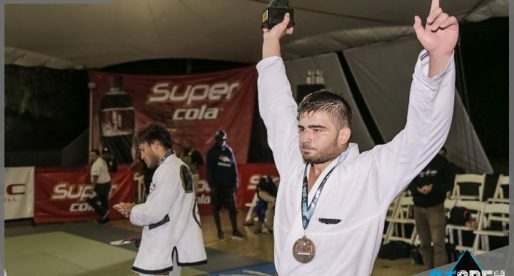 Having ahead of him, on Group 1, the current ADCC open weight champion, Felipe Pena, chances looked slim for the less experienced Johnson to reach the final. Not want to believe other people’s hype, Tex went for Felipe like a hurricaine, finishing the Gracie Barra prodigy fast with a heel hook from 50/50 guard, advancing through to the final with 2 wins and one draw in his group. On the other group, Craig Jones and Kaynan Duarte shared some of the favoritism going in, one representing the submission-only/leg-locking style of grappling (Jones) and the other the IBJJF/points based grappling (Duarte). After two interesting opening rounds, both athletes (as expected) met to decide who would advance to the final. In a relatively short match, it was a leg locking exchange that sealed the deal for Kaynan. The match-winning sequence took place when the Brazilian reached the back of the Aussie star after a leg control attempt by Jones, finishing with a choke from the back. Duarte looked very impressive throughout the Grand Prix with dominant performances from the 1st match to the final. In the last match Kaynan Duarte played a perfect strategical game against Tex Johnson, staying away from the American’s legs and passing the guard to secure the win. What a performance by the 21-year-old Atos stud, not only did he win, but he also walked out to ‘For Whom the Bell Tolls” by Metallica, and for that, we salute you in double.